At the start of practices, you want to have a good warm-up drill that gets your players engaged and works on building your team’s running game. 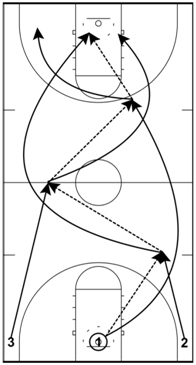 I have used a three-man weave drill in my time as a coach that have worked on passing, footwork, running the floor, and shooting lay-ups effectively. These are untimed drills for the players. Instead, we want the players to make a predetermined number of lay-ups or consecutive lay-ups without making a mistake. If a ball hits the floor for any reason, a player uses the incorrect hand in shooting a lay-up, a player travels, or a player runs the drill incorrectly, the lay-up does not count even on a made lay-up. 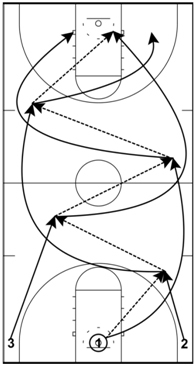 On all of these drills, players should pass and go behind the player who received their pass. The keys to the drill are to stay wide when running the floor, run the floor hard, and to lead the receiver with the basketball. Coaches should emphasize that if the ball is in the air coming toward them, use a jump stop to get under control with the mantra of “ball in the air, feet in the air”. 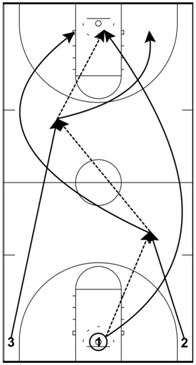 The first segment of the drill is with five passes before a lay-up is attempted (Diagram 1). Once the players have made the specified number of lay-ups, the number of passes will be reduced to four (Diagram 2) and then to three once the specified number of lay-ups has been made (Diagram 3). After the specified number of lay-ups has been made for the three-pass three-man weave, the drill is completed. During the drill, the players will count out how many passes they make before shooting the lay-up. The job of the coaches are to count the number of lay-ups made and to make sure the drill is being run correctly. The coach will not stop the drill once it begins for any reason other than if a player is injured. It should also be noted that this drill will not look good early on, but your team will get better at running it as you give it more time. The best way for them to get better at it is to do the drill daily. If you have a younger team, you will want to start with having them make a specified number of lay-ups early in the season. Later in the year, if your team is experienced and good enough, have the players make a specified number of consecutive lay-ups.